Whoosh! Screen Shine | Nerd Much? Look at that phone you’re using right now — the screen is filthy! Your grubby, greasy, oily hands leave fingerprints all over your phone’s screen. Now, there’s a screen cleaner that’s specifically designed to clean all of your smartphone and tablet screens that will also leave a nano-thin, invisible coating on your device to make it resistant to fingerprints. Introducing WHOOSH! Screen Shine, a uniquely formulated non-toxic cleaner that will have your devices shining like brand new in no-time. WHOOSH! 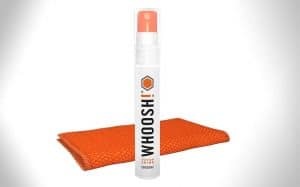 is sold in small bottles and a pocket sprayer (and they just announced WHOOSH! Wipes this morning) that makes it perfect for carrying around with you everywhere. It’s also odorless, as it’s entirely ammonia and alcohol-free. Most importantly, it’s safe for use with your electronics — unlike the water you’ve probably been using to wipe your devices with. You can buy a small 0.3-oz bottle for under $7, or a 3.7-oz bottle for $16. It’s widely available, and the new WHOOSH Wipes will be rolling out to national retailers soon. For more cool stuff to buy, stay tuned to Nerd Much for daily finds. You can also follow us on Twitter for an endless flow of cool things.